Paying for health care has become an important issue for older Americans and their adult children. 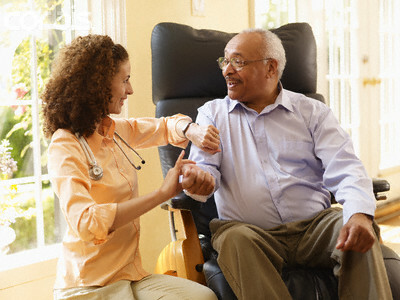 As medical costs continue to rise for pHome Health Care prescription drugs, in-home care, and physical rehabilitation, seniors are having to shoulder a larger share of the financial burden or turn to their children for help. In addition, while Medicare, Medicaid, HMOs, and private insurance pay for doctor’s visits, hospitalization, and home care, these plans frequently require co-payments and deductibles. Often, these plans limit prescription drug coverage and may not cover related expenses that can help a senior cope with frailty, illness, or disability, such as home modifications, transportation, or other comfort-oriented services. Fortunately, a reverse mortgage can pay for these health care needs. A reverse mortgage is a unique loan that allows seniors to convert equity in their homes into available cash to and use however they wish. It’s called a reverse mortgage because the flow of payments is “reversed” compared to a traditional home mortgage. The lender makes payments to you, or arranges a line of credit that’s available for your use whenever you need it. This differs from a traditional mortgage used to purchase or refinance a home, in which you must make monthly mortgage payments to a bank. With a reverse mortgage, you retain title to your home and can’t be forced to leave. The loan is repaid when you permanently leave your home. The versatility of reverse mortgages has already been demonstrated by the hundreds of thousands of seniors who have used this tool to alleviate money worries or to simply make their retirement more comfortable. Call The Reverse Mortgage Team today – we’ll give you all the information you need to make the right decision for your care. Reverse mortgages for seniors have become more popular in Bucks County and throughout most of the United States as our population ages. Locally in Bucks County, we see reverse mortgages for seniors being used to pay for medical expenses (including home care, prescription drug costs and insurance premiums) and to remove the requirement to pay on existing mortgage loans. Outside of Bucks County, in areas where the older population is moving, reverse mortgages for seniors are being used to purchase new primary homes or vacation homes. As one of the top 100 reverse mortgage lenders in the country, The Reverse Mortgage Team – from our headquarters in Bucks County – can help you understand the reverse mortgage options which may be best for you in paying for your homecare and how this may impact other benefits you may be receiving. Please give us a call – we would love to hear from you!